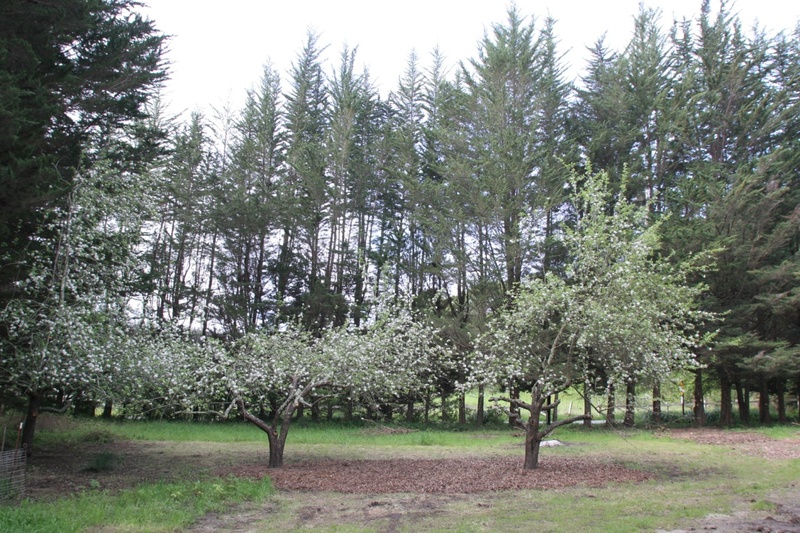 When we bought our property it had 3 neglected old apple trees. They stood in the shade of tall Monterey Cypresses to the South and East. Thirteen years later, the Cypresses have been cut and only the center apple tree remains. This year we harvested that tree for the 1st time. The cypresses along the edge of our property have been removed and replaced by a 2.5m (8') deer fence. 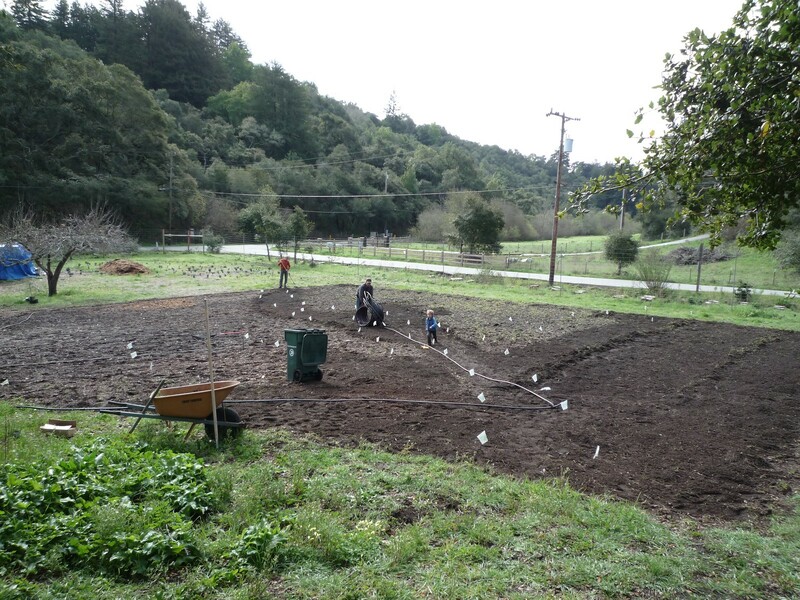 You can see the remaining apple tree on the left as we're laying out beds to farm. 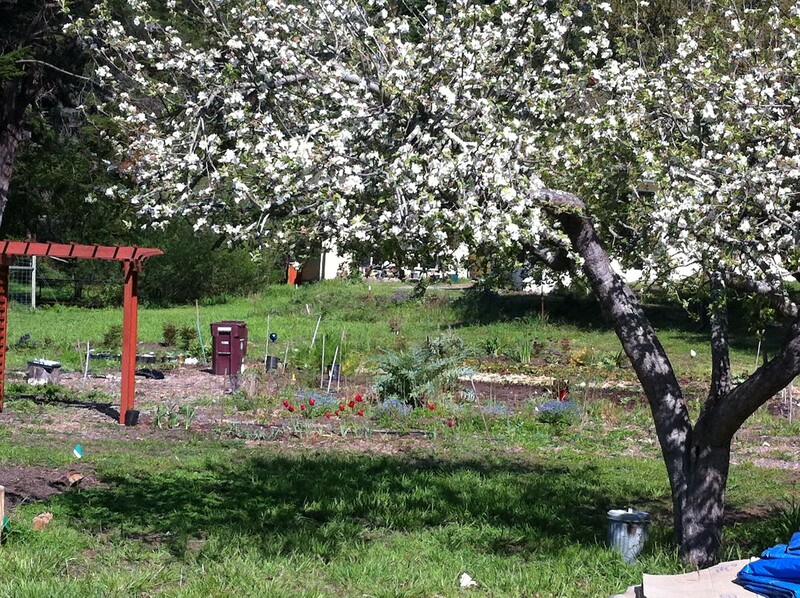 The apple tree blossoms as the beds have been planted out. Each year the tree produced a healthy amount of apples. 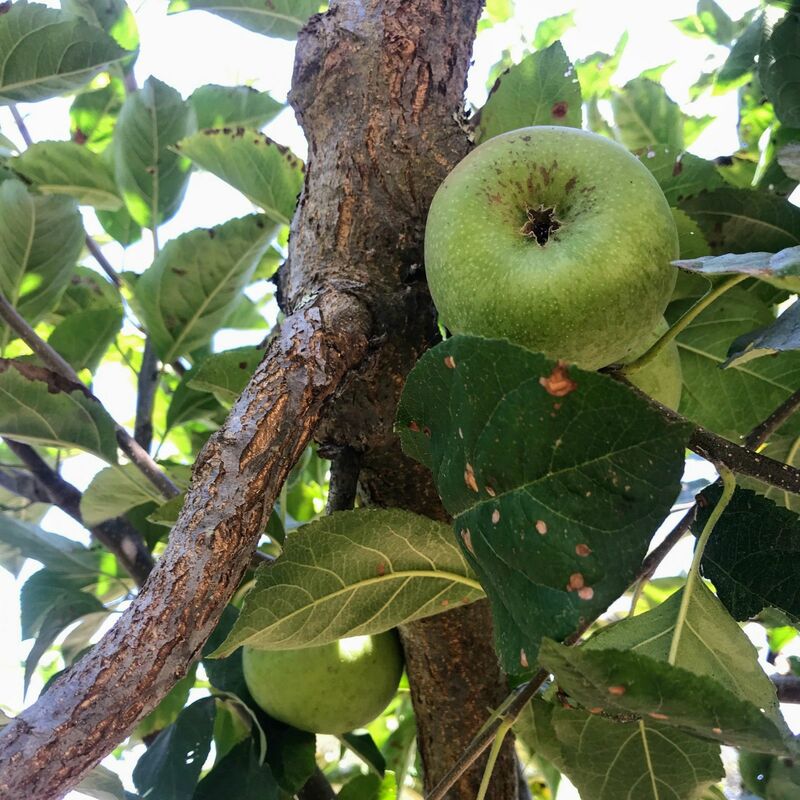 While this is the first time that we're harvesting the entire tree, it is not the first time we're harvesting apples from the tree. In the past, we've picked a bucket of apples here and there to make apple pie or apple juice with. 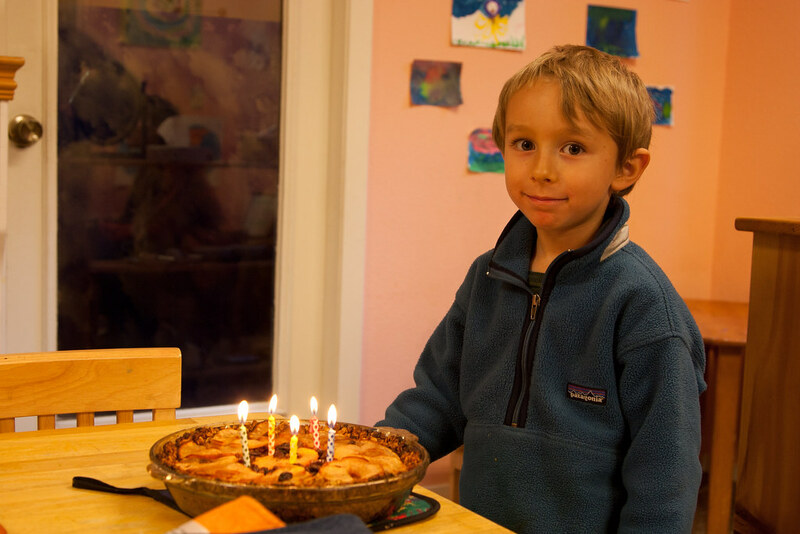 Casper's apple pie for his 5th birthday for example. This year we decided to make use of all our apples. And not by feeding them to the chickens, but to make hard cider with. A few years ago we harvested apples with our neighbor Ryan who threw an apple harvesting party. He had rented an electric fruit crusher and a (wine) bladder press to make quick work of the hundreds of pounds of apples we'd picked. That was a lot of fun and the cider Ryan had on hand was delicious. Unfortunately, the Santa Cruz coop who rented out electric fruit crushers and bladder presses closed last year (2016). Our Narwolk juicer —while mighty, is no match for the number of apples we'll have to juice. 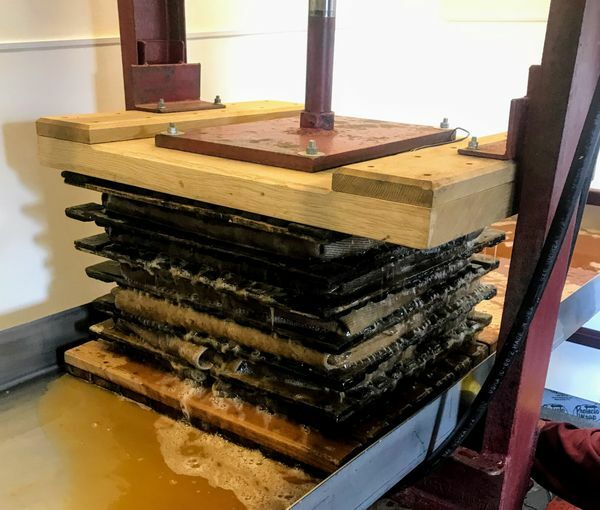 We couldn't find another rental source, but Tatyanna found the Mason Taylor Ranch willing to crush, press and bottle the juice from our apples for us. Mason Taylor Ranch is a local apple ranch in the Santa Cruz mountains who will process our batch of apples before they do theirs. We pay them for their time in exchange. Win! With the juicing problem solved we got to work on harvesting our apples. First, we cleaned 5-gallon buckets, 15-gallon plant pots, and miscellaneous other containers. Brought them over to our apple tree and started picking. This one tree yielded almost 250 lbs (~113 kg) of apples. We supplemented our apples with apples from another tree in our neighborhood for a total of 300 lbs (~136 kg) of apples. We're hoping that these 300 lbs will make 20 gallons (~75 l) of cider. This estimate is based on some Internet research and should be attainable with Mason Taylor Ranch's professional equipment. We'll found out soon. Our apples will be processed in a couple of days. Look out for a future post on our Cider Adventure. On Tuesday Tatyanna delivered our 300lbs of apples to the Mason Taylor Ranch along with 3 carboys, 3 piece water locks and sanitizer. The next day I helped juice the apples and started the fermentation process.